All paid Juicer plans provide robust moderation and filtering tools. If you are running a hashtag campaign or similar setup, you will probably want to manually review posts before they enter your feed, so you can only display the content you want. Simply click the "Moderate and Filter" panel of your Juicer dashboard, and select "Send all posts to moderation". Once you click this toggle switch to the "ON" position, you will be asked if you'd like to apply the change to existing posts. 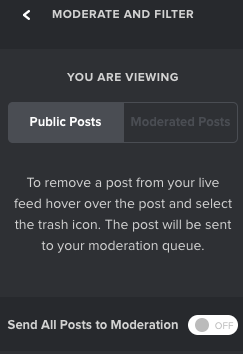 Click "no" if you'd prefer to keep your current posts and have future posts enter your "Moderated Posts" section. Click "yes" if you want to empty your "Public Posts" area entirely and start fresh. All current and future posts will be sent directly to the "Moderated Posts" section. You can also use the above feature for specific sources only, rather than your entire Juicer feed. Just click the source in your "Social Media Sources" panel and select "Set moderation filters". By default, this will apply the change only to new posts going forward. 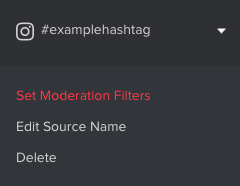 If you want to apply the change to all existing posts, go down to your "Moderate and Filter" panel, click "Save your filters" and click "Yes, apply to existing posts". There are also ways of automating the filtering. 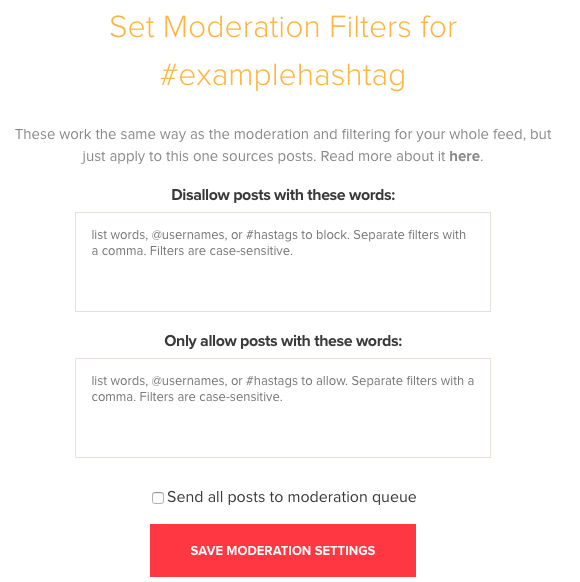 You can read more about these in our blog entry on moderation/filtering.